NZXT is mingling in the quiet zone with the unveiling of a new mid-tower chassis that it hopes, will deliver some serenity to your PC environment. The H2 dedicates itself to tranquillising noise with the usage of premium noise dampening foam to keep internal noise from the chassis under check, whilst the company adds a magnetic fan cover for an optional 140mm top fan to add further Zen-like measures. Should meditation not quite be your thing, this magnetic fan cover can apparently be removed to improve cooling potential. 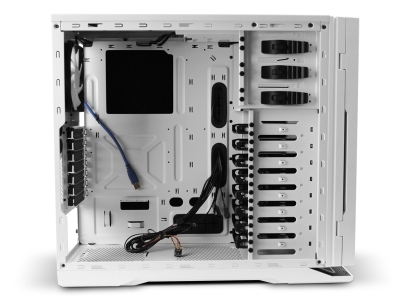 Continuing on the same theme, the H2 is fleshed-out with a 3-phase fan controller to take users through the 40 per cent, 70 per cent and 100 per cent fan speed marks and cooling duties, are delegated to included dual 120mm front fans and a single 120mm rear fan. 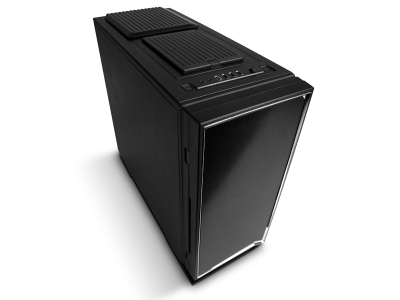 As well as the aforementioned optional 140mm top fan, the H2 also welcomes an optional 120mm bottom fan. Taking advantage of natural airflow, eight internal 3.5in/2.5in drive bays form a stance at the front of the chassis, with three 5.25in bays, externally. A 310mm long graphics card can be accommodated, yet with HDDs installed in corresponding bays, this scales back to 270mm. NZXT also adds a hot-swap capable SATA HDD Dock to the chassis top, adding to a medley of connectivity ports - USB 3.0 included. With 25mm space behind the motherboard for intelligent cable management, the H2 comes in two colour options - the classic black and white - shipping, at around $100 USD. To be fair, it's NZXT who used “dampening” in their press release, from which I presume Hexus just copied and pasted. Dampening noise one decibel at a time.. I like the look of that. Plain like my 300, but quiet. Front ports at the top of the case too.